As a child I was constantly bringing in critters from the outdoors. I had snails from the backyard as my pets for a while. I would let them crawl up and down my arms while sitting at my desk doing homework. 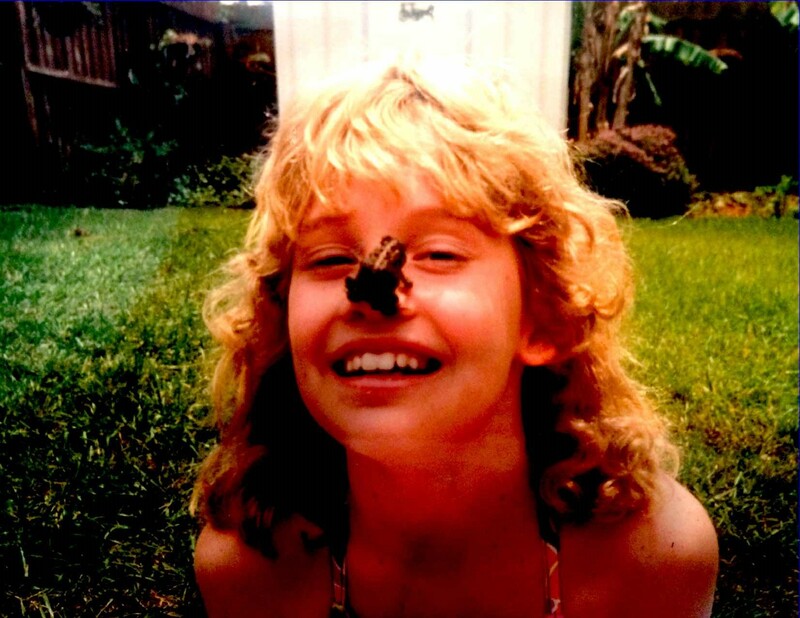 Frogs were also a favorite of mine, and I often posed with photos of them perched upon my nose. I still love to catch frogs whenever I return to my native Florida. My family would joke about my love for animals. Pick a cause, they would say. You can’t save everything. No dog was too dirty, no cat too flea-infested, and no animal was too ugly for me to love and hold and kiss. In high school I even spent about a week trying to save a “litter” of baby mice that had been thrown into a trash can with their dead mother still attached to the mouse trap. After hearing about the mice, I immediately went to the 30 gallon garbage bin and began pulling out old trash. I could hear the mice squeaking and did not stop until I had recovered all of them. I took them to school with me every day and to cross country practices and meets. I fed them with an eye dropper, diligently. But, even with all this care they eventually died one by one in my hand. I cried over that first tiny mouse body as if I had lost a friend. In my thirties, I became a hunter. It was after being introduced to the lifestyle by my “soon to be” husband. I had seen the horrific PETA videos and undercover footage of chicken and beef farms. I did not have a desire to become a vegetarian but I had definitely begun to veer away from conventional grocery store meat. I was already buying organic and free range meat whenever possible. Progressing from that into hunting seemed a natural thing. The question was, would I be able to take the shot? Anyone who had known me as a youth would have guessed I could never take the life of an animal. I probably would have agreed with them. So, when I went on my first hunt for antelope; I was an incredibly nervous and novice hunter. After a long day of hunting, I finally took down a doe antelope with one shot at 60 yards. I was by myself, as my husband was further down the road. I approached the doe as she was taking her final breaths. I was surprised at my calm. I was surprised at my lack of regret. I was respectful but also proud. I was no longer an ignorant bystander in the process of how my family was provided for. I was the provider. I knew this animal’s death was humane and quick because I was the one to take the shot. I knew her life was the original free-range because I had tread upon the same sacred ground she had. How does one reconcile me as the animal lover and me as the hunter? How can one respect life and also take life? I don’t know that I would have understood that answer before I became a hunter myself. Hunting has opened my eyes to the delicate balance between the needs of humans and of wildlife. It has made me an even stronger advocate for maintaining this balance. A fact of life is that for everything to live something must die. That is a fact. We cannot separate ourselves from this cycle as much as we might make “moral” arguments that we can. The way that I reconcile myself as an animal lover and as a hunter is that I now know that the sustenance that fuels my family, my body, and my pursuits had as good of a life as could be possible. That animal was a free range and wild animal. I know that the death of that animal was as quick and humane as possible. I know that when I sit with that animal ,as its spirit is crossing from its body into the air around us, that my love and my respect are mingling with it in that moment. I NEVER had that experience with my food before becoming a hunter. I am PROUD to be a hunter and honored to be a part of the process. I smile, not because I am unkind or to gloat over the death of another living thing. I smile because at that moment I feel more connected with life than on any other average day. I want to remember that moment. I want to remember that animal. I want to look back on that smile years from now and honor the memory and the life that was given to sustain mine.